Research is developing new understanding of forage, fiber, and the animal’s ability to use them. We have also increased understanding of the genetics of alfalfa to allow improved variety selection methods and enhanced performance for the farmer. This paper will consider both topics. Generally dairymen have perceived grasses to be too high in fiber for high producing dairy cows. But, with knowledge of digestible fiber, we have learned that the fiber of grass is more digestible than that of alfalfa. This has opened some new opportunities for dairymen and many have begun to incorporate some grass into their rations. Increased seeding year yields – some grasses, such as Italian ryegrass, will establish faster than the alfalfa and produce more total forage yield in seeding year than alfalfa alone. Wider harvest window on second and later cuttings – many cool season grasses head little or not at all after first cutting, therefore regrowth is primarily leaves which change little in forage quality over 7 to 10 days around harvest time. Faster drying – 30 to 40% grass with alfalfa dries faster than either pure alfalfa or pure grass. Some less winter kill or injury to the alfalfa stand, losses from flooding – some grasses will survive standing water and/or ice in low spots of field better than alfalfa. Beware that some varieties of orchardgrass and tall fescue are not as winterhardy as others and will die before alfalfa. Ability to apply manure to stands with less traffic damage and stand loss – grasses suffer less traffic damage than alfalfa. Grass/alfalfa mixtures have higher total fiber than alfalfa alone which may be needed in some high corn silage rations. The fiber of grasses is more digestible than alfalfa. Potential to reduce non fibrous carbohydrate (NFC) of dairy rations – Too much readily fermentable carbohydrate can reduce milk production through acute or sub acute rumen acidosis. One of major contributors to increased lameness in dairy cattle (which has increased in the Midwest in recent years to 20 to 25% of all dairy cattle) has been formulation of high starch, low fiber diets (Cook, 2003). Grass runs about 15% NFC while alfalfa is about 25% NFC and corn silage is about 35% NFC. Initial feeding trials we have run have indicated that that we could maintain high levels of milk production when replacing a portion of the corn silage and alfalfa with grass silage, even though dietary NDF increased slightly. The key to managing alfalfa-grass mixtures for high quality dairy forage is to maintain forage stands that contain about 30 to 40% grass. When the composition of the stand is in this range, nitrogen fixation from legumes can meet the needs of the grass species, and fiber content of the mixture is still acceptable. In trials conducted at the University of Wisconsin three grass species (orchardgrass, tall fescue and meadow fescue) were seeded with alfalfa at three. Alfalfa was seeded at the rate of 645 seeds/m2 with varying grass seeding rates of 15 to 75%. All seed lots had over 90% germination. 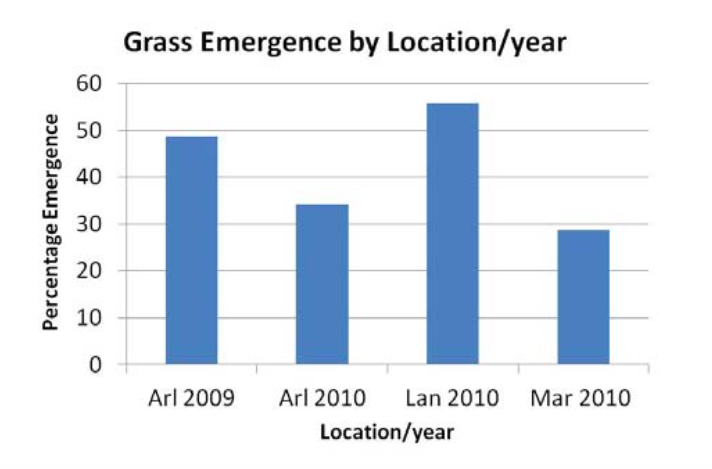 Seedling emergence was based on plant counts taken 30 to 40 days after seeding As the graph at right the mean grass emergence varied greatly among sites and years. Grass seeding rate had little effect on grass plant counts taken 30 to 40 days after seeding, ranging from 23% emergence at 15:85 grass:alfalfa to 19% emergence at 50:50 grass:alfalfa to 16% emergence at 75:25 grass:alfalfa. 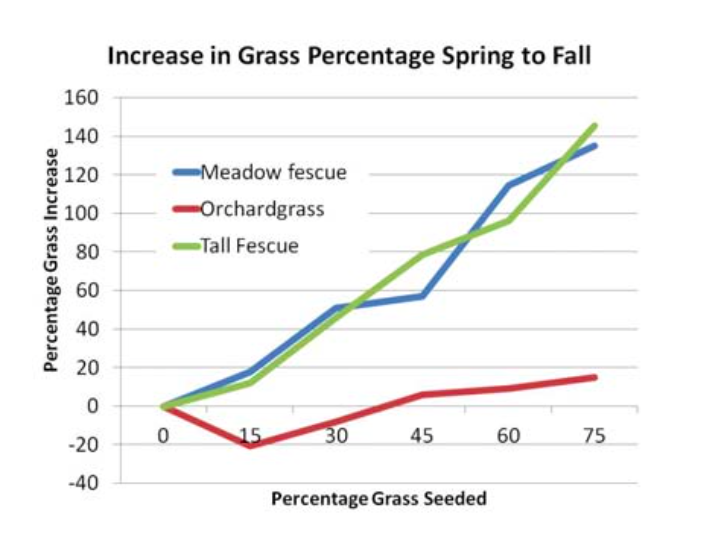 Tall fescue and meadow fescue had similar emergence across the seeding mixtures (26 and 24%, respectively) while orchardgrass had lower emergence (9%). Grass establishment was significantly higher at Lancaster than at the other two sites, suggesting a large environmental effect for establishment. The reason for this is that the grasses studied begin to germinate at slightly above freezing (about 2 to 4°C) while alfalfa requires slightly warmer conditions (5 to 7°C). The optimum temperature for germination of these grasses is about 15°C and for alfalfa is about 25°C. Alfalfa is much more susceptible to seedling diseases if the early establishment temperatures are lower than optimum but will grow out of the stages rapidly if temperatures are warmer. Grasses also prefer cooler temperatures during the early stages of development while alfalfa predominates when temperatures are higher (above 25°C). Thus the alfalfa to grass seeding rate has much less effect on the final stand than the environment under which the germination occurred. Emergence of alfalfa was not affected by the grass seeding rate except at the very highest levels of grass seed. Therefore higher grass seeding rates resulted in higher grass percentages in the final mixtures. In general, as grass seeding rate increased, the alfalfa declined as a percent of the total stand. It is also apparent that orchardgrass had less effect on alfalfa stand reduction than the other two species. It is important to recognize that more plants emerge than contribute to the final stand. In fact the biology is that many plants germinate and begin growing; then the stand thins to what can be maintained by the soil and environment. We have found, for example, with pure alfalfa, not matter how many pounds of seed are used per acre, the stand will thin to 30 to 35 plants per square foot by summer’s end. This study shows that the same principle applies to grasses: at higher seeding rates more plants emerge but then greater thinning occurs as the season progresses. However the fescues did not thin as rapidly as the alfalfa and the percentage of grass plants tended to increase as the season progresses. Orchardgrass has lower germination and declined at about the same rate as the alfalfa so the alfalfa/grass percentage remained about the same as the season progressed. 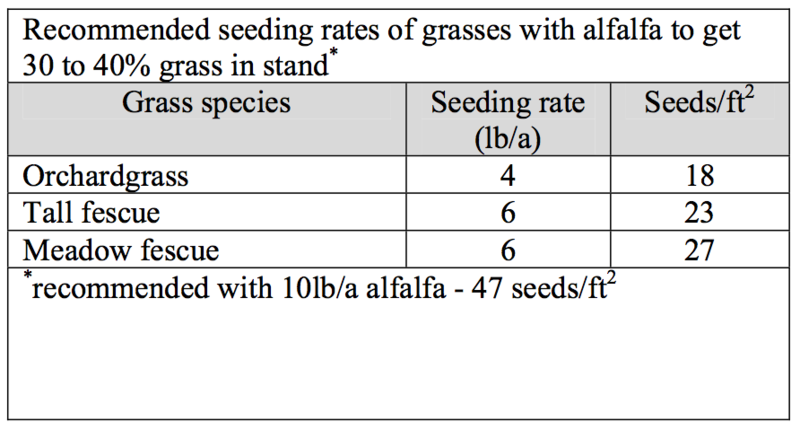 Thus our recommendation is to seed moderate rates of grass and alfalfa as shown in the table. We would also recommend seeding about 2 lb/a Italian ryegrass (but no more!) to get a cutting of the ryegrass before the alfalfa/grass mixtures are ready to harvest where early season moisture is good. Note that the seeding rate recommendations are generally for 60 to 75 seeds per square foot and expect to get about 30 to 35 plants per square foot by the end of the seeding year. Desired alfalfa/grass mixes can be maintained by picking appropriate grass species and varieties. Timothy and smooth bromegrass tend to produce too much forage in the spring but little the rest of the year so we recommend mixing either orchardgrass, tall fescue, or mea- dow fescue with alfalfa. These species will produce more grass in second and later cuttings. The choice of grass species has little effect on the total season yield of mixed stand. We have found that, generally, alfalfa/grass mixes yield the same as pure alfalfa stands if the alfalfa is growing well. Thus, while meadow fescue in pure stands tends to yield somewhat less than tall fescue in pure stands, when mixed with alfalfa, the yield of the mixed plot is about the same for the two grasses. Meadow fescue tends to be higher in forage quality than other cool season grass species. Appropriate selection of grass varieties is crucial to success in alfalfa/grass mixtures. Selecting a good grass variety is more important than the grass species selected! Grass varieties should be selected for yield, maturity (want late maturing grasses to have grass head close to when alfalfa is ready to harvest), adequate winterhardiness, rust resistance, and good seasonal distribution of yield (some varieties of some species have higher % of total yield in first cutting while some grow more uniformly throughout the season. Information for good grass variety selection is available at https://fyi.extension.wisc.edu/forage/category/trial-results/.